A 50th anniversary celebration like no other, we led a series of digital festivities for the internationally known New York Hilton Midtown designed to do justice to the famed name while leveraging emerging marketing tools. A key initiative within the celebration was a Facebook-centric promotional campaign where participants were given five equal chances to win a stay at the New York Hilton Midtown. This promotion provided the opportunity to showcase the history of the location, raise awareness of the hotel’s impressive and notable history, and reward our loyal Facebook fans for their participation in our social media presence. With a budget under $20,000, we utilized earned media and capitalized on the strength of our growing Facebook fan base to drive traffic from Facebook—where the sweepstakes was promoted—to the 50th anniversary, parallax scrolling microsite developed by our UX and design team. 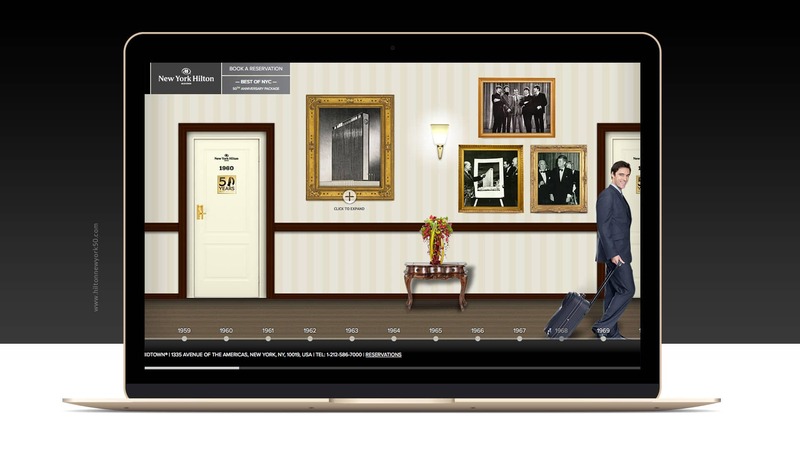 We provided five equal chances to win a 3-night stay at the New York Hilton Midtown in five Facebook-centric monthly contests, each with graphics themed to a specific decade—60s, 70s, 80s, 90s, and 2000s—to showcase the legendary hotel’s 50 years of operation. During the highly interactive campaign, Facebook users were immersed in our strong social media presence and clicked in droves to New York Hilton Midtown’s stylized microsite.